Matcha: the word itself is so perfect isn’t it? The color breath taking so much so that my web designer created my signature color from Matcha. The perfect pairing to my Noble Baking I must say. You know that feeling when things are the perfect match? That is how the matcha color is for my brand. This recipe came about from exploring healthy “sugar free” if we can use this term as it really is deceiving (does this really exist probably not as everything that is pastry has to have some form of sugar right? Be it dates, erythritol or stevia). As a hypoglycemic (with a sweet tooth) and being a very sensory pastry chef and a huge foodie it was devastating to know that I could not eat what I made, and that sugar was killing me softly. In 2011 I decided to sell my very successful pastry workshop where I taught 60 students a week (mostly traditional pastry) and sold premium ingredients and kitchen equipment. I was soo stressed out trying to save up for pastry school, I had this wild dream of studying in the French Pastry School in Chicago and like most chefs and business owners was burned out. I fainted in the movies 1 month before moving to Chicago and my blood sugar went down to an alarming 45 (normal is 90), long story short: I had to find a new way to eat and live. I felt so sick I was desperately seeking a radical help and a friend recommended an iridiologist who literally changed my life. He said: you are pre diabetic and you MUST make radical changes and become a fat burner not a sugar burner. After 18 years of hypoglycemia this was “kind of” new to me. So I did everything he said and eliminated: sugar, flour, processed foods, cured meats, dairy, meat, alcohol and focused on eating clean, green, low glycemic fruits, and great quality proteins for 3 months. This recipe came out of that new life style. And it became viral literally.. it has been translated to Portuguese, English and has been featured in my online classes for thousands of viewers. I love it.. Just note: you need to splurge on very high quality matcha if not it will be very bitter and not pleasant. Grease a pound cake/medium size pan with coconut spray. Preheat convection oven to 330 F, a regular oven to 340 F. You can use a silicon cake loaf pan which makes a beautiful soft crust or use individual flexipan or silicon pans as well. Sift flours and baking powder and salt and matcha. In a KitchenAid mixer with a whisk, beat eggs, vanilla and sweetener, beat until airy and lemon color. Add the oil and mix until combined. Add water and mix. Add the sifted flour. Mix to combine. Don’t over mix. Pour batter into prepared pan. Add fruit on top if you choose too. Bake until a toothpick comes out clean approx. 25-30 mins depending on your oven and size of pan. If you bake with a silicon pan you must put it on a perforated tray, it will also take longer to bake. Remove cake from pan. Cool on rack. Decorate with healthy confectioner’s sugar and matcha. Note: You can also make cupcakes or cakes. Delicious recipe! I baked it as a bread and sliced it. Hi Naie! Thanks so much for making this! Me encantaría saber si estas recetas fantásticas las puedo encontrar en nuestro idioma. Temo no ser una traductora profesional u muero por preparar alguna de tus nobles recetas. Hola Silvia mil gracias por tu mensaje, si abres mi página web usando CHROME (en vez de Safari) te da la opción de traducir, por el momento no puedo traducirlas pero lo estoy considerando. Gracias. Saludos! 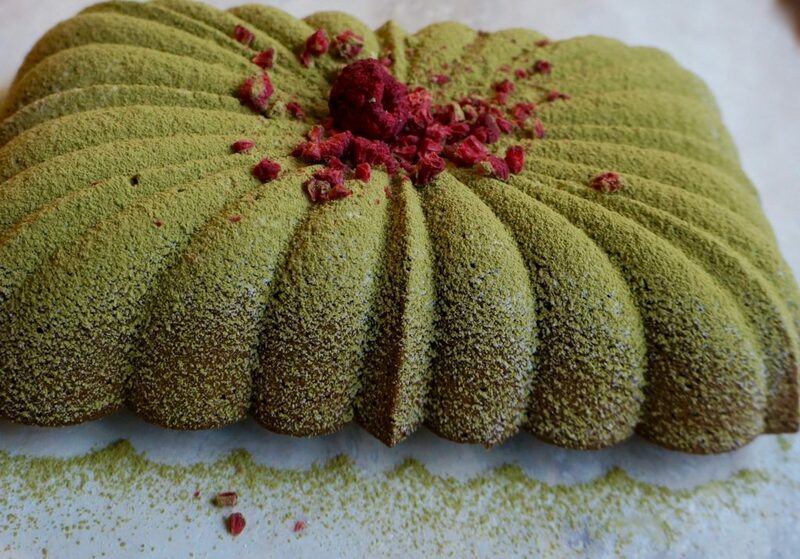 Hey Buddy!, I found this information for you: "MATCHA CAKE". 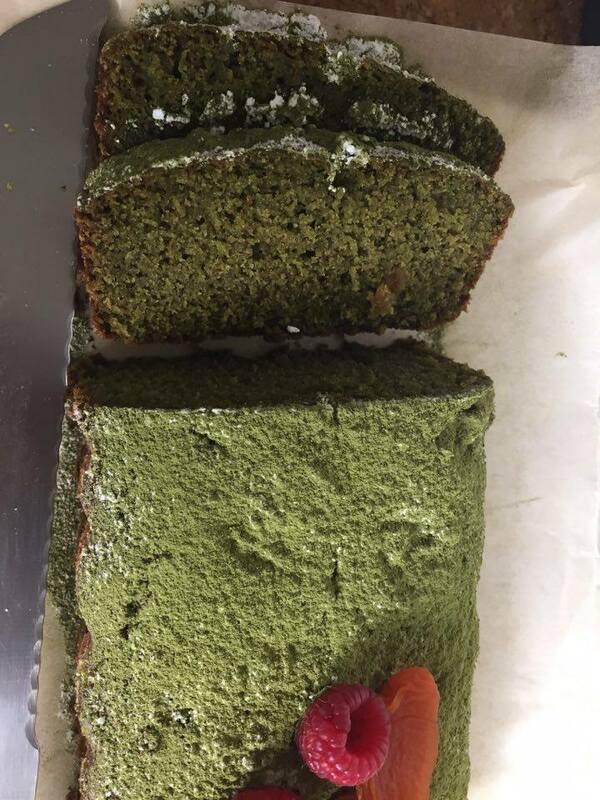 Here is the website link: https://www.vanessamusi.com/matcha-noble-cake/. Thank you.